If you’ve read my book Social Media for Writers, you’ll know that I am very much Team Instagram rather than Team Pinterest. Personally, I find Instagram to be way more creative. Pinterest is more about collating things which have already been created. Of course, it can also be a great source of inspiration for creativity, so it’s not just about moving tiny pins around a screen. Then with the reboot of this blog I decided that it was time to take a fresh look at Pinterest. So I pinned a few images and ~whoosh~ immediately saw a big influx of traffic. And since site hits are like catnip to bloggers, suddenly I am ALL ABOUT THE PINTEREST. Generally I’ve found that I prefer group boards that lots of people pin to. That way you get to explore lots of other stuff pinned by other board contributors, plus you get many more eyeballs on the pins you place. 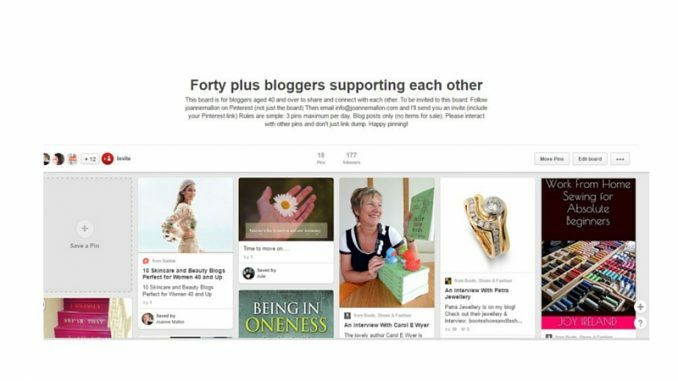 I looked around for a shared Pinterest board for bloggers over 40 but couldn’t find one. As so often in life when you think I wish some guy would create this, eventually you realise that you’re the guy. So I did. 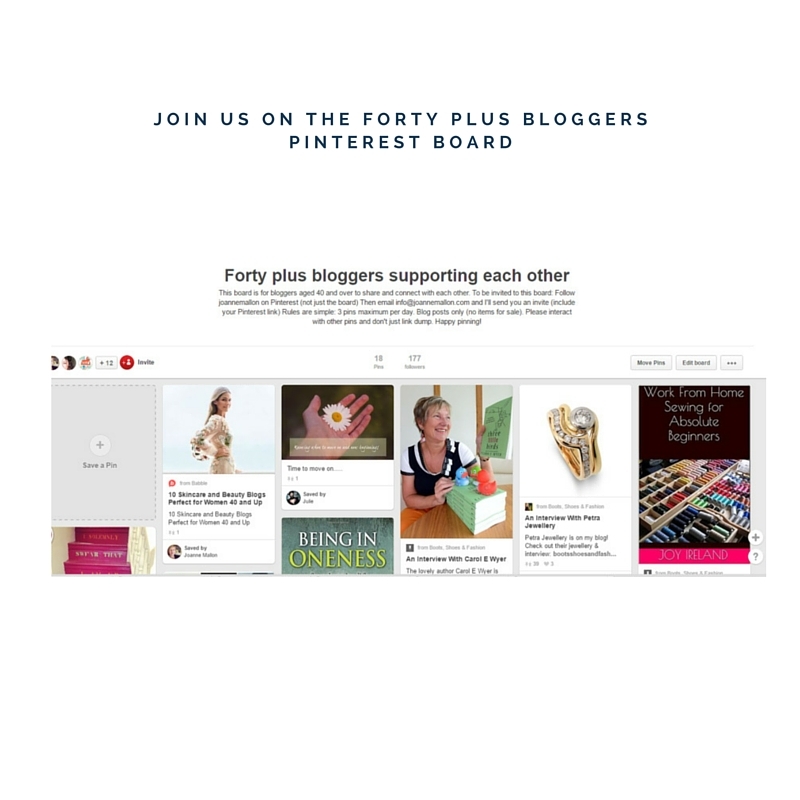 The Forty Plus Bloggers supporting each other Pinterest board is now live and everyone is welcome to follow and/or contribute. I’d love to see you there. Read the instructions at the top which will tell you how to join and contribute to the board, or drop me a line with your email address and I will send you an invitation. All bloggers over 40 are welcome, no matter what you write about. Please don’t use the board as a link drop; think of it as a community. As a rough guide, aim to engage with as many pins as you add. So if you add 3 pins, also heart, repin or click through to three others. It’s like all of social media – if you approach it with both arms open to embrace, instead of just one hand out to take, then you will receive twice as much.